As part of this week’s Task, the Chasers were supposed to paint a picture that depicts love or hate as the theme for their pieces of art. 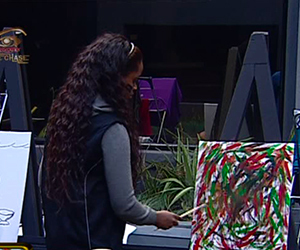 In the garden, there was a canvas for each of them and a variety of paints and brushes to help them execute this Task. The idea was to use the theme as inspiration with a few elements of their own personalities in them. The paintings will form part of their presentations where the entire House will decide which painting is the best and this painting will be sent to the other Houses to be judged. So each House depends on the other House’s decision to win this part of the presentation. Already all the Chasers got down and dirty trying to decide what to paint and how their personalities will therefore be portrayed through their paintings. While some Housemates were busy painting in the Diamond House, the likes of Melvin took a nap. This HoH is clearly not pressured for time. Annabel, Biguesas, Natasha, Neyll and Pokello are up for possible Eviction this week. Vote now to keep your favourite in the game.